Deep inside the Saranda sal forest, Thalkobad lies at the core of what was a CPI (Maoist) “liberated zone” in Jharkhand’s West Singhbhum district along the Odisha border. Thalkobad, along with 24 other villages, was reclaimed by the Indian state after a massive military operation – Operation Anaconda-I in August 2011 to destroy the CPI (Maoist) Eastern Regional Bureau and several training training camps inside Saranda. The village bears scars of conflict – a high machaan used by the then rebel government of the village is intact but the secondary school building the Maoists took cover in to return fire at the CRPF is gone. The rebels blew up the school before escaping. Saranda is a “laboratory for how to consolidate on security successes,” said Jairam Ramesh, Minister for Rural Development, in a recent interview. Mr Ramesh launched Rs 250-crore Saranda Development Plan (SDP) in 56 villages here in 2011 and has since announced similar plans for rebel-controlled zones in Latehar and Bokaro districts recovered through recent paramilitary operations. Two years on, Saranda villagers are still awaiting schools and health centers, even as mining companies have lined up to invest in the newly secured forests. In Thalkobad, the adivasi villagers recall the pitched battle that August: most families fled to Karampada 13 kms away for a month, 18-year-old Munna Soya and his father were taken by the Central Reserve Police Force in a helicopter to Ranchi on suspicion, detained and beaten in several police camps and later released, 50-year-old Jarda Honhaga was beaten so severely that he died in the hospital. From the 25 villages, 37 persons were arrested, more than 100 were detained. The CRPF returned six months later bearing sarees, blankets, and farm implements. In the last few months the villagers have watched the construction of a security camp next to their village, and then a road connecting Karampada to Jaraikela. Some have found temporary work with the road contractor and in MNREGA. Others fear new mines will be opened in the forest. “If mines open our land will be ruined. The river will have only red water. We are not literate. How many of us will find jobs?” said Binodini Purti who cooked meals at the secondary school that was blown up. Almost all the villages in Saranda struggle for drinking water. The forest is the catchment of three large rivers – Koina, Subarnrekha, and Damodar, and several streams flow through it. But there are 12 large mining companies operating in 200 sq kms of this 800 sq km forest which holds one-fourth of India’s iron-ore reserves. The Ho adivasi living in the forest first launched ‘Lal Paani Andolan’ against the pollution of the streams from effluents and surface-run off in 1978 at Noamundi and their resistance has continued. “All 56 villages are in need of potable water. There is a problem of high iron content in the water,” notes the Saranda Plan outline of October 2011. Thalkobad, Tirilposi, Baliba lie downstream of Steel Authority of India (SAIL)’s crushing plant at Kiriburu where ore is washed and crushed into uniform pieces. 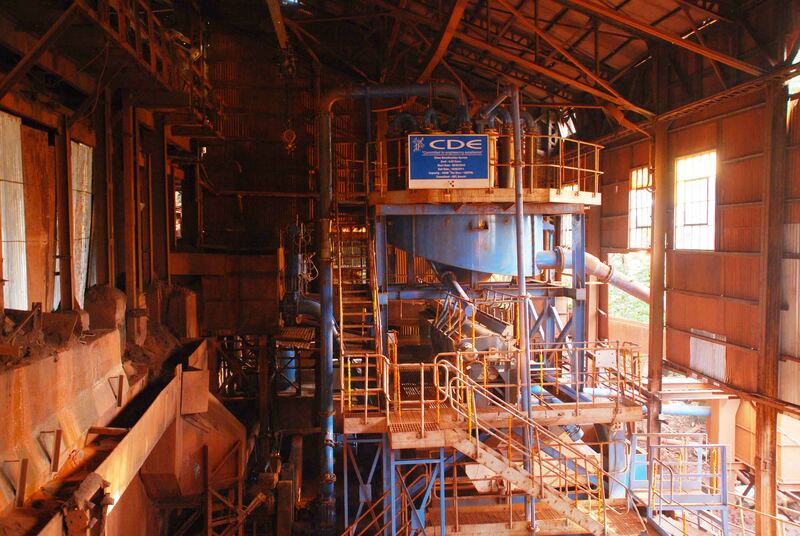 At Kiriburu, SAIL’s Rs 4.23 crore-slime beneficiation machine meant to extract ore from the water that is discharged back into the river does not work. “It has not worked even once since it was inaugurated in 2010. When the inspection teams come, the guesthouses are full and the orchestra comes from Jamshedpur,” says a SAIL official. SAIL’s mines in Saranda accounted for over 80 percent of its 15 million tonne production last year. 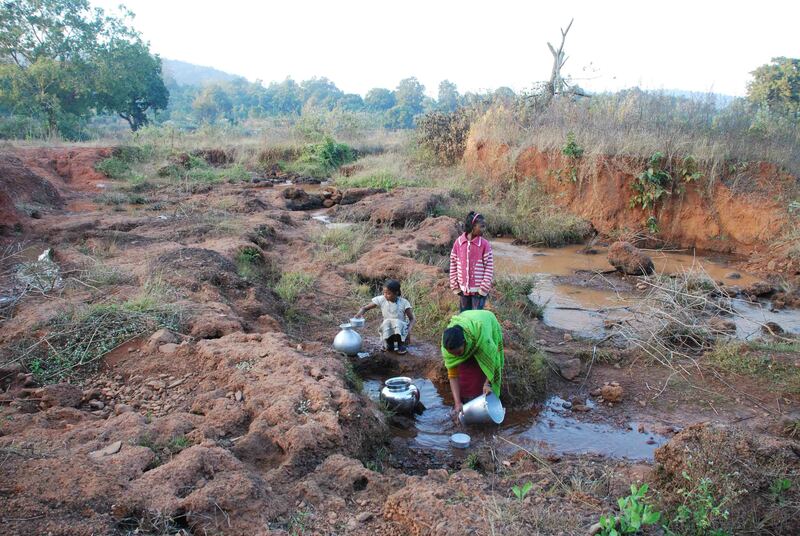 Downstream, villagers dig shallow pits, a few inches deep by the river to collect drinking water. Farms in Thalkobad, Karampada, Navgaon, Bandhgaon, Mirchgada, Bahada, Kalaita, Jumbaiburu have been ruined by the ore-laden water. “I cannot say about the beneficiation plant but the Kiriburu plant is being modernized. 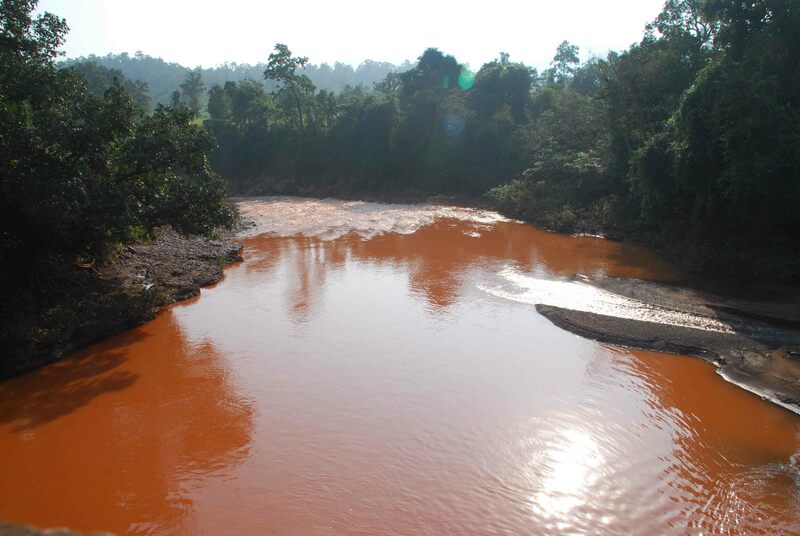 The river is polluted because private mining companies wash 200-250 dumpers carrying iron, oil and grease everyday in the river. I check them when I spot them,” said Dilip Bhargava SAIL General Manager (Mines). Since January, the Cabinet Committee on Infrastructure headed by the Prime Minister has recommended clearance for open-cast mining in Saranda forest in areas that form the Singhbhum Elephant Reserve to three private firms. JSW Steel owned by Sajjan Jindal got lease of 998.7 hectares in Ankua forest divison, Jindal Steel and Power Limited (JSPL) led by Congressman and industrialist Naveen Jindal got 512 hectares in Ghatkuri forest. 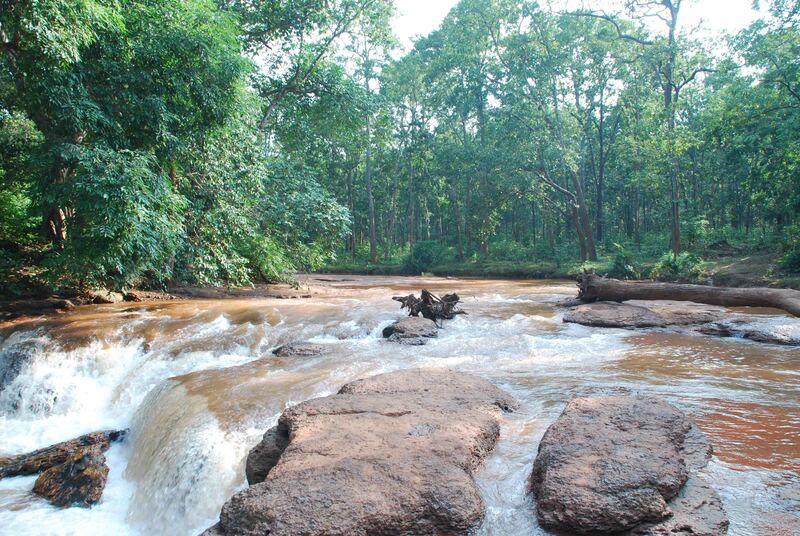 The approval of 138.8 hectares forestland in Ghatkuri to Rungta Mines Limited was nearly completed last month. There are 155 proposals on the anvil for leases in 500 sq km – nearly two-thirds of the forest. On paper, the proposals must first be recommended from the state government. “We have little say in the recommendations,” says a senior forest official. “There are over 600 elephants in Saranda. More mining may disturb their migration intensifying their attacks on villages,” says state Principal Chief Conservator of Forests AK Malhotra in Ranchi. A proposal by the department of forest to notify 63199 hectares forest in Saranda as inviolate is pending since 2006. Ironically, the recent approvals to private firms are riding on the back of clearance given to SAIL in Februray 2011 to mine iron ore in Chiria in Saranda by Jairam Ramesh. Mr Ramesh, then Minister of State for Environment and Forests had overturned the Forest Advisory Committee’s decision to grant approval to SAIL citing the Public Sector Unit (PSU)’s “Rs 18,000 crore IPO on the anvil”. Private mining firms have cited the proximity of Ankua and Ghatkuri to SAIL’s Chiria mines to argue they too be granted permits in the already “broken,” what is no longer pristine, forest. Mr Ramesh in 2011 said that in Saranda, he was in favour of mining only by the PSU but there was no executive order to back this or grant it legal status. As the government has issued a slew of mining permits, the minister in interviews to the media asked for a 10-year moratorium on mining in Saranda. “A gap of 10 years will allow the situation to stabilize, will allow building trust among the locals, and allow time to train and educate local people to take advantage of the economic opportunities that mining throws up but there seems to be a desire on the part of the government to allow mining in Saranda,” said Mr Ramesh to The Hindu. There has been no public reaction from the UPA to Mr Ramesh’s suggestion. While in Thalkobad where the secondary school building was blown up by Maoists, Surendra Purti, a high school graduate from the village volunteers to teach teenaged children in the primary school building. He is not paid any wages. The teachers stopped coming long back and the nearest high school is in Manoharpur, 45 kms away. At Tirilposi, the next village 17 kms away, there are 90 school-going children but no building. “CRP sahib broke the roof,” explains village munda Budhram Gudiya. The plan lists building 10 Integrated Development Centers (IDCs) – each will have a hospital, besides an anganwadi, ration shop, banks – only one has been completed at Digha this April. To improve health services, a mobile health unit has deputed since last October to visit all villages. “The ambulance visits regularly,” say villagers in Thalkobad. But it has not yet been spotted in Tirilposi though a motorable village road exists. In January an eye-health camp was held by a private hospital. “More than a third of over 1000 villagers had pterygium – a painful inflammation which may lead to blindness – because of exposure to mine dust,” said Dr Bharti Kashyap. There is hectic activity in all villages to build new Indira Awas houses. This March as part of the Jharkhand State Livelihood Promotion Society’s efforts to provide long-term livelihood security, a team of trainers of Self-Help Groups from Andhra Pradesh visited Saranda. The team stayed 15 days in Thalkobad but no meetings have been held since it left. Villagers say they are unsure what to make of their visitors. “They said “hum se judiye”(join us). That is what the party (Maoists) used to say too, and look what followed,” said Binodini Purti. At Tirilposi, villagers explain it differently. “Most families earn Rs 60 a day after selling siali leaves in the market in Barsovan in Odisha. What will we save?” asks Budhram Gudiya. Then there are families in debt to pay legal expenses. Guvida Honhaga (60) among those arrested by CRPF got bail last year after his son Bimal, a mine worker, spent Rs 160000 on legal expenses. “I borrowed Rs 40000 each from four people at 20 per cent interest. Now he is required to go Chaibasa court thrice a month and that costs Rs 900 –a fourth of my salary,” said Bimal Honhaga. Bilarman Kandulna, 25, a political science graduate from a Manoharpur college was elected panchayat representative in Digha in 2010. “Some manki-munda (community leaders) now roam in Scorpio SUVs, but a few boycotted the Electrosteel public hearing for Kudalibad mines last year. Last April, we held demonstrations in the villages. The company then shifted its public hearing in Bahihatu, 20 kms away,” says Kandulna. “What is the use of forest pattas when they give mining leases in the same forest?” he asks. Of 812 claims for individual forest rights, 511 were accepted till April, the rest were rejected as they fell in mining lease areas. Though a significant number of community rights – over 1200 – have been granted under SDP. 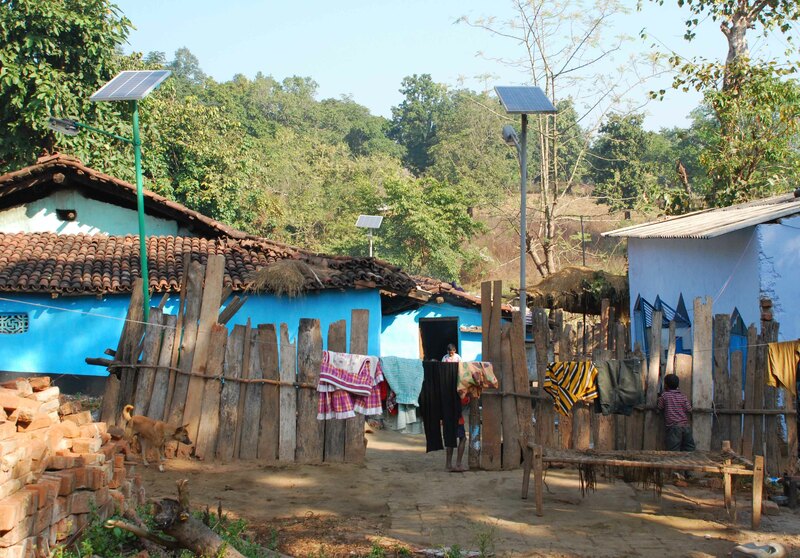 At Jamkundiya at the house of Laguda Devgam, the manki of 22 villages, there is no Scorpio car, but there are three solar street light poles towering on three sides of his house – the only streetlights in the otherwise non-electrified villages in Saranda. They are inscribed as gifts from Rungta Mines Limited, Usha Martin Industries, and Tata Steel. All photos by Manob Chowdhury. 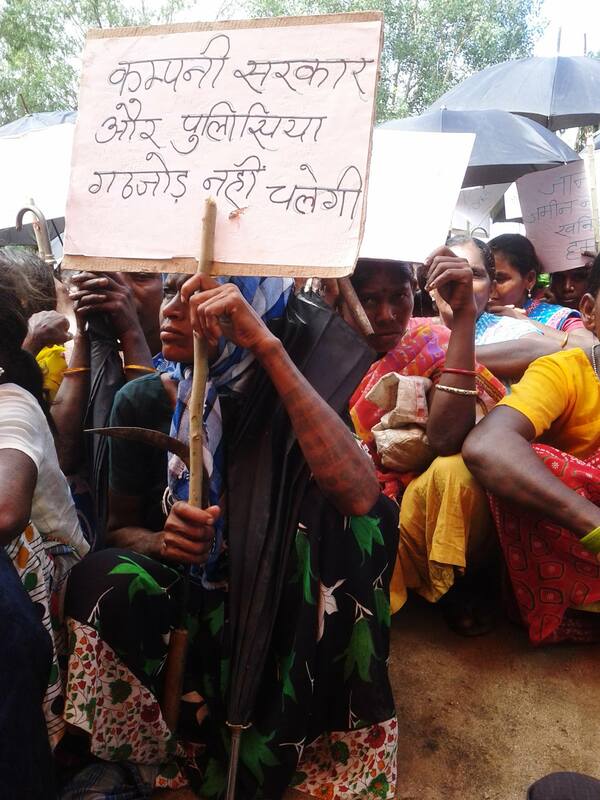 More than 50 tribal farmers, including women, were detained for over six hours on Tuesday at the Sundarpahari police station in Godda, a kilometre from the venue where President Pranab Mukherjee laid the foundation for a thermal power plant to be set up by Jindal Steel and Power Limited (JSPL). 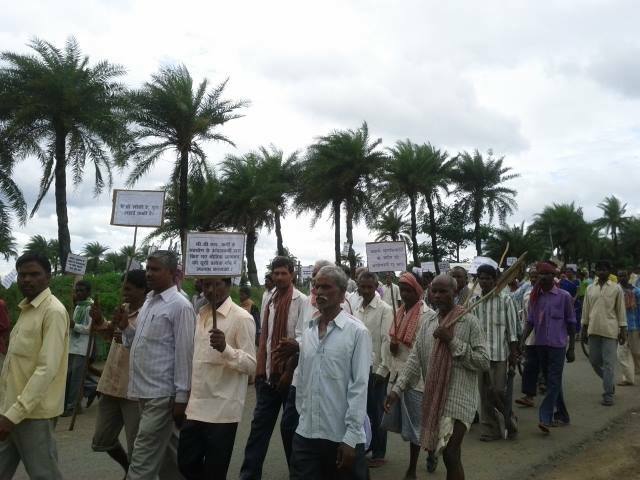 Farmers from 11 villages in Nimpaniya and Goiarijor blocks said they had gathered in Sundarpahari to oppose land acquisition by the JSPL. At 10 a.m. they were detained by the police and kept in the station premises till evening. “My family lives in Seemaldhap village in Chota Amarpur. More than 200 of us had gathered at Tiril tola over the last two days because we planned to march to the venue but the police arrested us. I had rice with me for my little daughter but the police kept that away too,” Hopanmai Marandi told this reporter. “We had already been displaced when the Sunder Dam was built. We will not allow ourselves to be moved from our land again,” said another villager Mary Nisha Hasda. As part of the JSPL’s expansion plans in Jharkhand, it had announced the setting up of the 1,320-MW captive power plant in Godda at a cost of Rs. 8,500 crore. The plant will use coal from the Jitpur coal black and water from the Sunder Dam and the Gumani and Jalhara rivers. The JSPL, in a statement, said all land for its projects had been acquired “through the government acquisition route, with consent of the people,” a point the company director and MP Naveen Jindal reiterated at the inauguration ceremony attended by Governor Syed Ahmed, Nishikant Dubey, MP (Godda), and political leaders, including Subodh Kant Sahai, Hemlal Murmu, Devidhan Besra, MP (Rajmahal), senior state officials and pradhans and mukhiyas from seven villages. Superintendent of Police Ajay Linda denied anyone had been detained. “There was overcrowding at the venue because so many villagers wanted to attend the inauguration function. Then some of them stayed back at the police station which is only a km away,” he said over phone. 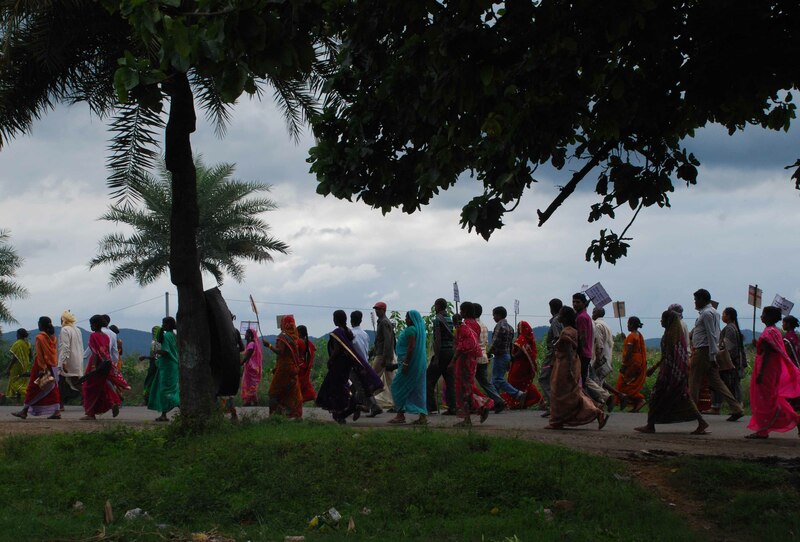 Away from the police station, hundreds of policemen and home guards carrying sticks walked around villages. “Only the families in Bangali Tola agreed to sell land to the company, the rest of us have refused. The police have been coming to the village regularly now. All land around this village is my land. Its yield lasts us the whole year; we will not give up this land,” said a woman in Kalhajhar’s Charai Tola. “My father is in the Nimpaniya panchayat samiti. My family and 30-35 families from my village are ready to sell our land. How else will we move to cities?” said Sujit Kumar, who is home during a break from his training at an industrial training institute. Godda lies in the Santhal Pargana region of Jharkhand. All land transactions are governed by the Santhal Pargana Tenancy Act (SPTA) and most of the land is non-transferable and non-saleable, whether owned by tribals or non-tribals. 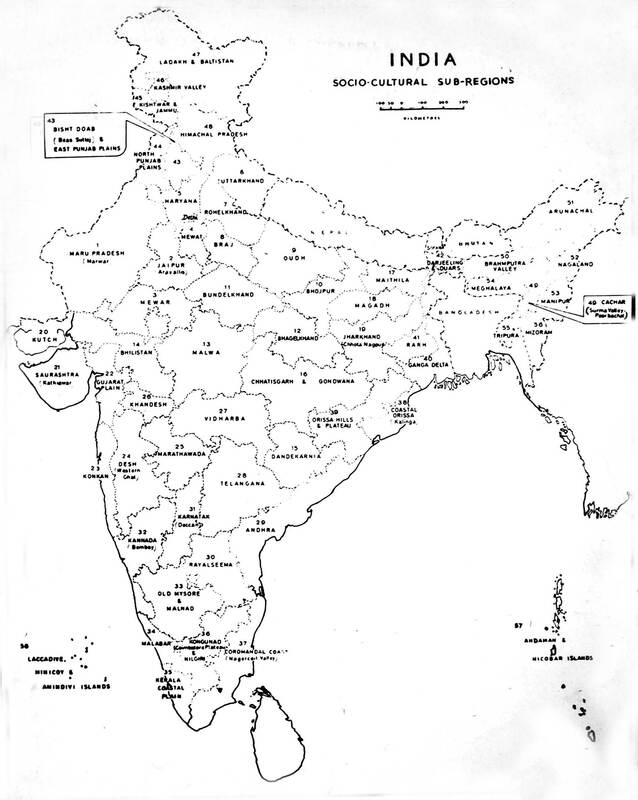 “Because of the Santhal rebellion against the British in 1855 in which 30,000 Santhals died fighting to protect their land, only land classified as Gair Majurwa Khaas (GMK) or land listed as non-agricultural land owned by the government can be transferred. The rest of transfers — except those done as gifts to relatives etc. — are illegal. It is not possible that a power plant will be built only on the GMK land. Despite these norms, officials continue to alienate tribals from land,” said Ramesh Sharan, economist at Ranchi University. This report appeared in The Hindu here.